I bought a beautiful hand made glass dish at IKEA and got to use it for Family Home Evening tonight. I made a brownie trifle. 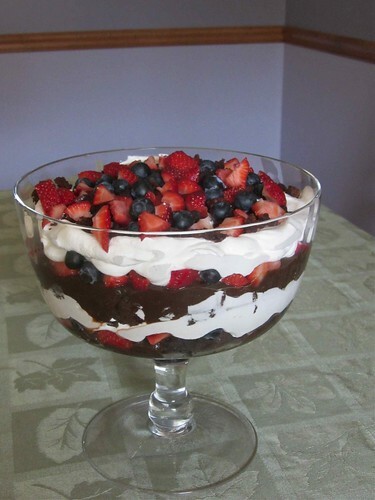 Here's the recipe: brownie layer, chocolate pudding layer, strawberry and blueberry layer, cool whip layer, repeat. It was good. All of us and two big ball playing guys from ND thought it was delicious. On a side note, Meg beat one of the big guys from ND in a game of ping pong. I won't embarrass him by sharing his name but his initials are M.T. (which happen to be part of her initials too). I can't believe she beat him. She made sure to write it in her journal. He's lucky she doesn't have a face book account yet.